Navigating streets in 21st century America can be downright scary for everyone involved—pedestrians, cyclists, and motorists. And it’s too often deadly. We’ve all felt it before, that sense of dread crossing the street at one point or another. I cringe every time I see a lady break into a near sprint to cross the street on foot, even when the pedestrian light is shining. It’s difficult enough to get around the core city, a place historically set up for pedestrians, and near impossible in the far-flung suburbs connected by arterials designed for car speed and not much else. City leaders today are looking to remedy the dangers of navigating our streets, including here in Louisville. 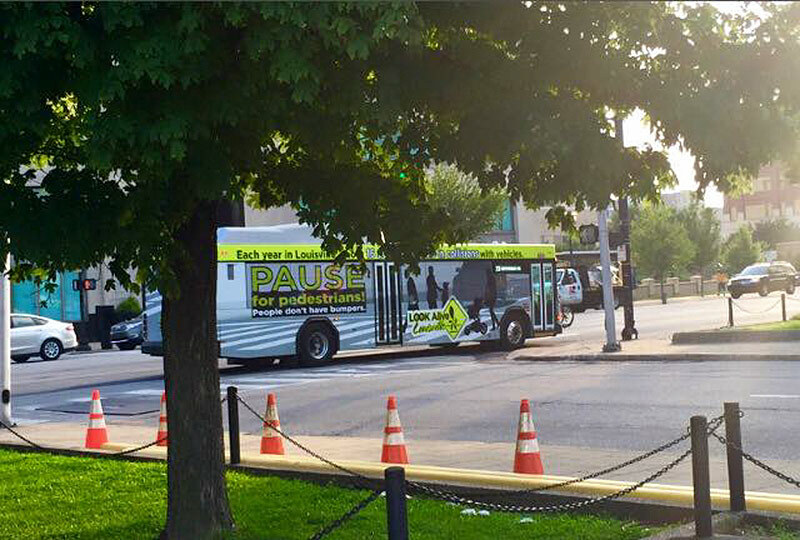 Our city is in the midst of a three-year pedestrian safety campaign called “Look Alive Louisville,” that calls for education and enforcement to curb traffic violence and reduce incidence of pedestrian deaths. “We want to add to the many things that Louisville is proud of, being recognized among the safest cities in the nation for pedestrians,” Louisville Mayor Greg Fischer said in a statement this spring. He was referring to the on average 16 pedestrian deaths on Louisville streets each year. Metro Louisville Public Works’ Bike Louisville and the Louisville Metro Police Department (LMPD) have joined forces to usher in a new era of safe streets. But can Louisville’s campaign make lasting marks on street safety? Does the three-year Look Alive effort go far enough? Let’s dig into the forces that led to our current predicament, explore what’s happening on the streets of cities across the country and at home, and look in depth at how this latest campaign hopes to bring safer streets to Louisville. We’ll be covering street safety, piece by piece, in a series rolling out all this week. 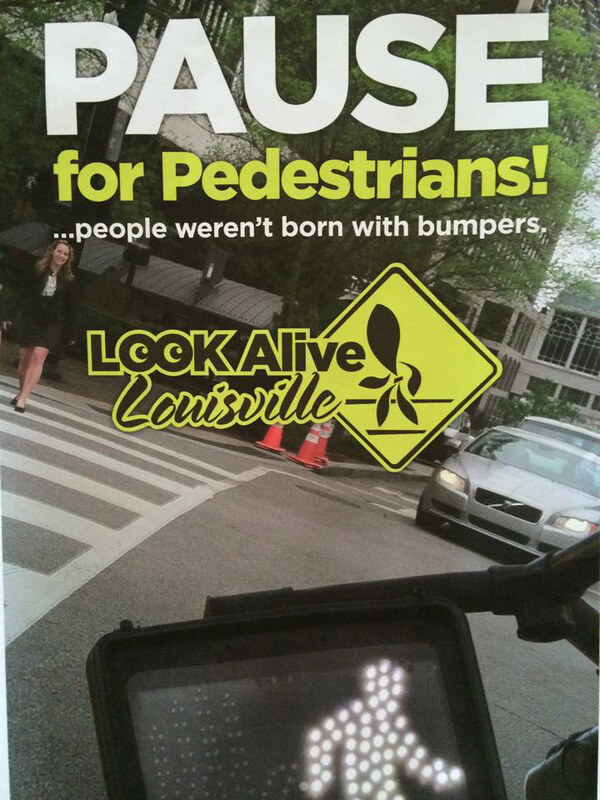 In the face of a rising pedestrian injury and fatality rate, and an above-national-average incidence of pedestrian death, it was welcome news in April 2014 when Louisville landed a $307,000 grant from the National Highway Traffic Safety Administration (NHTSA) to help with education and enforcement to reduce pedestrian fatalities. New York City and Philadelphia were also awarded grants. That funding was augmented by a $120,000 grant from the Kentucky Transportation Cabinet in July 2014 for a street safety education campaign. Fischer also announced he had signed on to the year-long Mayors’ Challenge from the U.S. Department of Transportation. I covered that program earlier this year at The Architect’s Newspaper. That report, Understanding Pedestrian Crashes in Louisville, Kentucky, 2006–2010, takes a data-driven look at exactly what is happening on our streets. It breaks down crash data, looking at what reported actions contributed to crashes, where collisions occurred, and who was most likely to be hit. “We’re trying to figure out, based on the data, what could we do to target some of those factors for crashes. What’s leading to people getting hit on our roadways?” Eisinger said. Look Alive Louisville even has its own an anthropomorphic fleur-de-lis pedestrian dubbed “Louie the Looker” after one of Mayor Greg Fischer’s famed social media contests. Advertising for the campaign features the walking fleur-de-lis and cautions drivers to yield to pedestrians. Developing a youth pedestrian education curriculum for schools. “We worked closely with JCPS to create a curriculum that meets their needs. We piloted the curriculum last spring, then made some tweaks,” Eisinger said. His team met with teachers and refined the so-called “Walk Sense” curriculum for a full rollout this fall. A so-called “pedestrian decoy operation” to bring education and enforcement to five dangerous intersections. “We looked at our data and we saw one of the major reasons pedestrians were getting hit is that motorists were failing to yield to pedestrians in the crosswalk,” Eisinger said. LMPD officers have been on the streets handing out pamphlets to motorists and pedestrians with street safety information, and now they’ve begun handing out tickets for infractions. “We’ve created a training video for our officers, so that no matter which officer implements the decoy operation, the methodology is the same,” Eisinger noted. The decoy operation is targeting five deadly intersections: Second Street and Broadway, Fourth Street and Broadway, Fourth Street and Market Street, Preston Highway and Gilmore Lane, and Bardstown Road and Goldsmith Lane. While the first two educational components have largely flown under the radar of local media, the enforcement campaign is causing some controversy, specifically as it cracks down on pedestrians themselves. We’ll take a closer look at what it hopes to achieve and why it’s sparking debate this week. This pedestrian safety campaign is great news for Louisville, especially since walking is becoming more popular than ever. The city is promoting active lifestyles to combat the city’s notoriously unhealthy reputation. Hundreds of new residents are returning to the city’s core and taking up a new walkable way of living in the city. And it’s needed more than ever. If Metro wants safer intersections (Goldsmith Lane, dueling Thorntons and a car wash large enough for space ships ) then stop approving carcentric developments! Duh. Waivers variances and other nonsense only serve to foster autos over pedestrians. Drive through a building liquor on Bardstown Road, and other weird ideas. How about quirky crosswalk art, like man with turtle downtown?! Celebrate local pedestrians….! In England they actually have signs for Elderly Crossings!